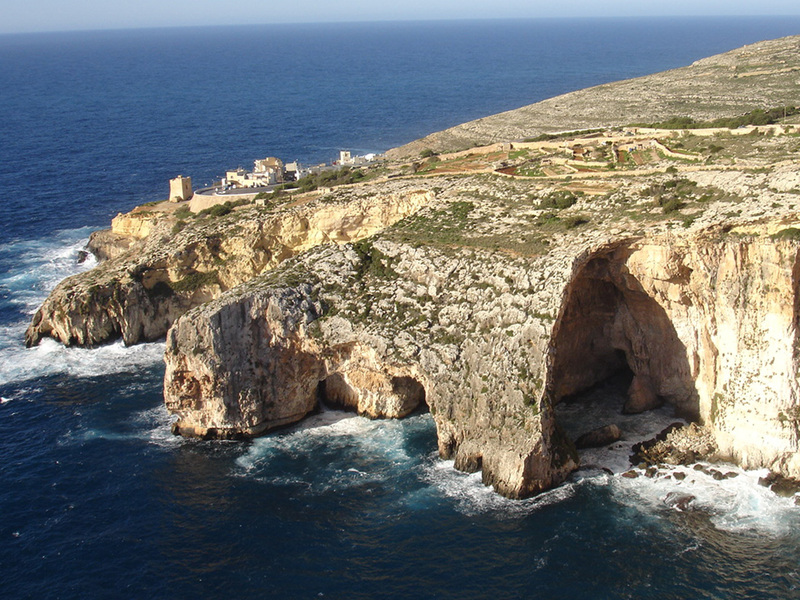 Coming down to Blue Grotto from the Zurrieq road one cannot fail to see the deep ravine that is Wied Babu to one’s left. 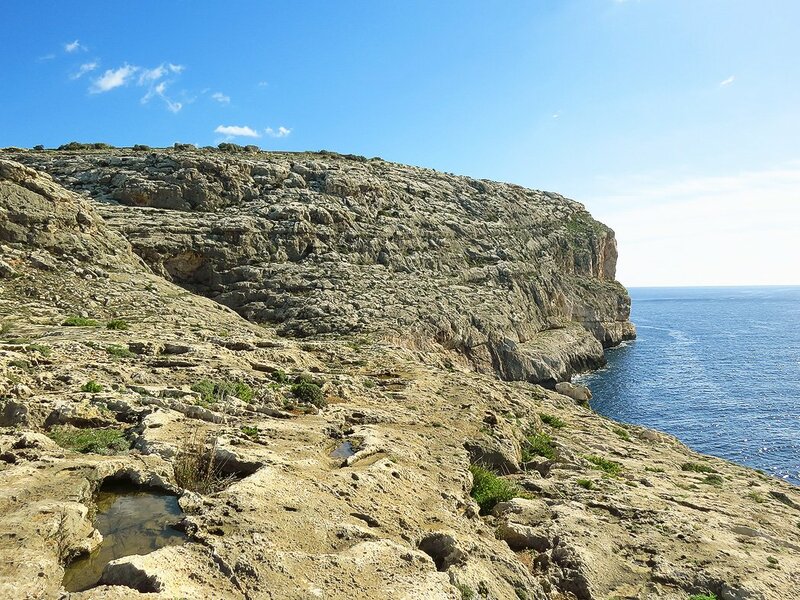 Contrary to the well-known Wied iz-Zurrieq and the grotto itself however, the rural cliff area east of Wied Babu remain relatively unknown, visited mostly by a few fishermen and farmers from Zurrieq and the nearby areas. 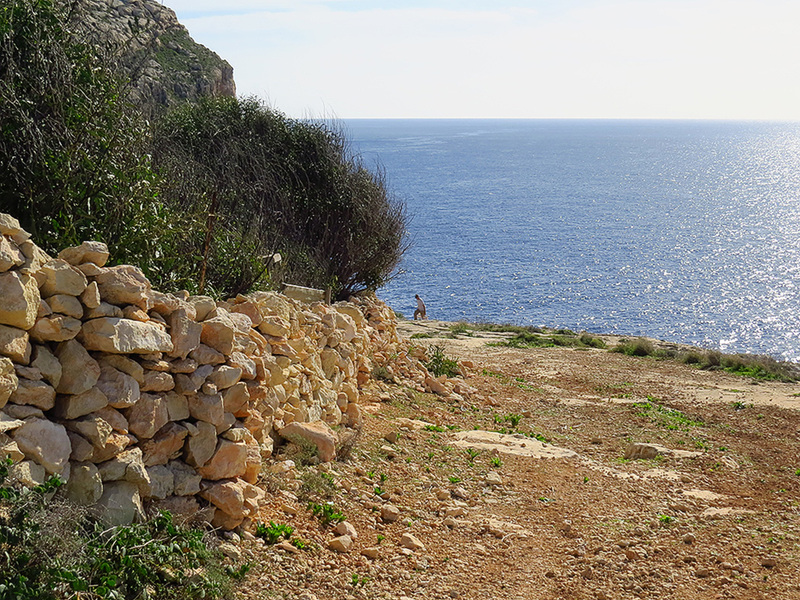 This curious, rugged area is best accessed from either Bubaqra or Nigret – two outlying but adjoining suburbs of Zurrieq. On Nigret’s hilltop stands a small public garden with a few info boards about the area. Below the garden one finds a maze of country paths among small cultivated fields and the few trapping sites which characterise the area. 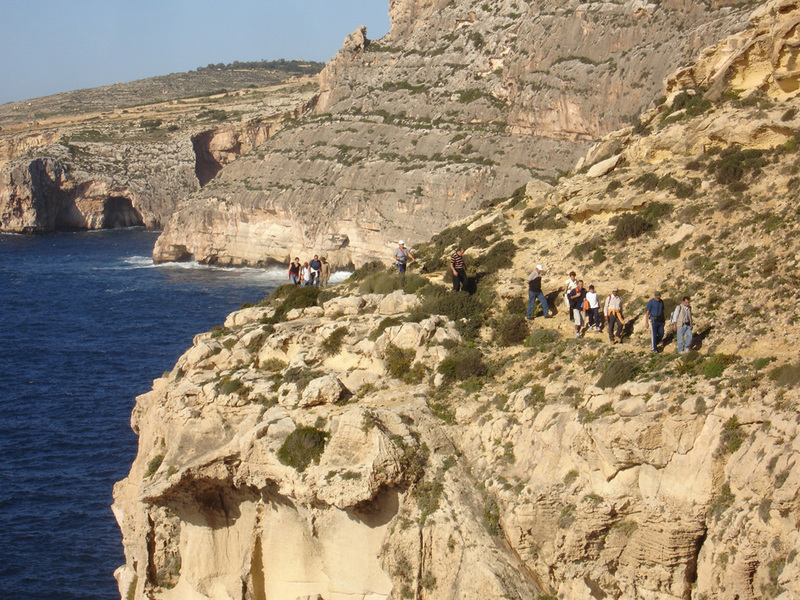 Walking westwards from here one is regaled with one of the area’s best views from a point called il-Munqar (literally ‘the beak’) a rocky outcrop which commands views of the Blue Grotto far below from a somewhat different angle than is normally seen. Cliffside (or more landward if preferred) tracks going eastwards from here skirt the cliff tops or meander through the country lanes towards the area’s other highlight – the ravine of the small steep valley of Wied il-Bassasa. Wied il –Bassasa is remote and the odds are that there will only be a fisherman or two around here – if at all. But it’s quite an awesome landscape … almost lunar in its barrenness and with the mighty cliff wall of Fulija practically marking this area’s eastern end. From Wied il-Bassasa one can make his way back to Nigret via the same route or, better still, start the steep but relatively easy climb towards Bubaqra. Along the way one passes by a large quarry. This was the scene sixty years ago (18th February 1956) of one of Malta’s worst peacetime disasters when a Scottish Airlines’ Avro York aircraft chartered by the RAF crashed in this remote area, killing all 50 people on board. The crash site was cleared and no visible traces remain today – although a plaque at the previously mentioned Nigret gradens commemorates the victims’ memory. Nearer Bubaqra one finds Wardija tower – one of Grand Master’s De Redin 14 watchtowers which girdle the island at strategic places, and the last of the ‘set’ to be constructed in 1659. From the watchtower it’s another short hilly walk to the hamlet of Bubaqra. The hamlet is a quiet place, characterized by a small central square and Zurrieq’s main cemetery just a block off the square. In the vicinity one also finds Nigret Palace – a curious castle-like building dating back to 1715 andwhich today serves as a convent for the nuns of Saint Theresa but is unfortunately off limits to visitors. 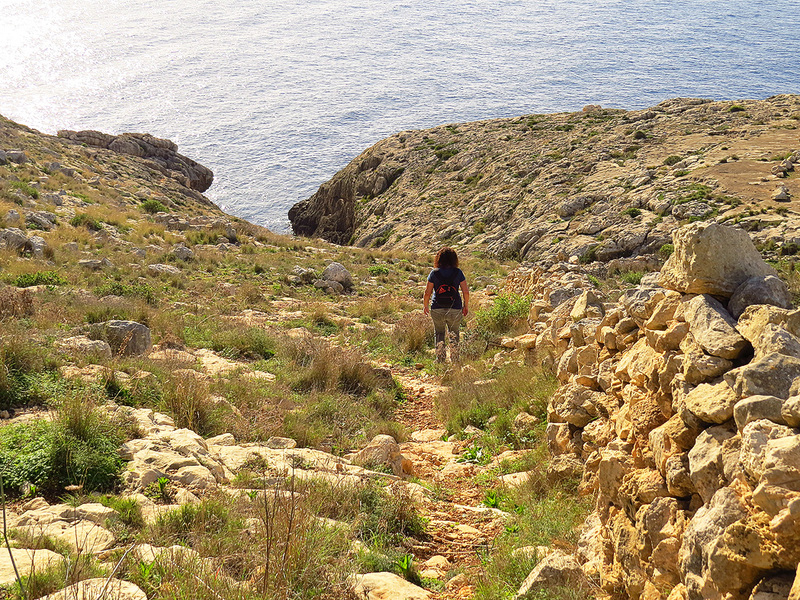 A relatively short 10 minute walk from here will get you back to central Zurrieq.